The quiet hours of a 0300 wakeup. A hot coffee sitting in the cup holder of my car. Some nice country music playing over the speakers. No, this isn’t a Coors commercial. It’s the start of another epic adventure to my favorite National Park: Yosemite. Before I get started, there’s something you need to know to truly understand me: My car is one of my favorite things in my life. After a life changing solo road trip across half the US last year, driving pivoted from being entirely unenjoyable to being something looked forward to. Being alone in my beautiful Jeep Patriot with the windows rolled down and music playing over the speakers gives me necessary time to reflect on the little things that make life so great. The knowledge that every time you step into your car seat and grab the steering wheel you are going on a trip defines me. Whether it’s to the local In-N-Out or a place halfway across the country, it’s a feeling that is very hard to beat. I’ve been to my fair share of National Parks and outdoor epicenters over the course of my life. Being a Boy Scout, I went camping at least once a month all over California, and my family loved going all the time. I’ve been to the Grand Canyon, Kings Canyon, Joshua Tree, Sequoia, El Capitan, Bryce Canyon, Big Bear, Mammoth, and Catalina Island, just to name some of the jukebox favorites. Yet, it wasn’t until recently that I was able to add Yosemite to the list. It began when a friend and I went Memorial Weekend last year for a short day trip. That experience changed my life. As we passed the gate to cross into the park, my heart pumped faster with excitement, arriving at a vast natural wonderland. Driving through the forest and seeing the Sierra Nevada’s is awe inspiring, but nothing prepared me for what lay at the end of a long mountain tunnel. There is something about the sheer scale of nature that just can’t be captured and expressed in a photograph or video, no matter how nice it may be. I had seen pictures of the famous Tunnel View vista before, but nothing compared to seeing it in person. 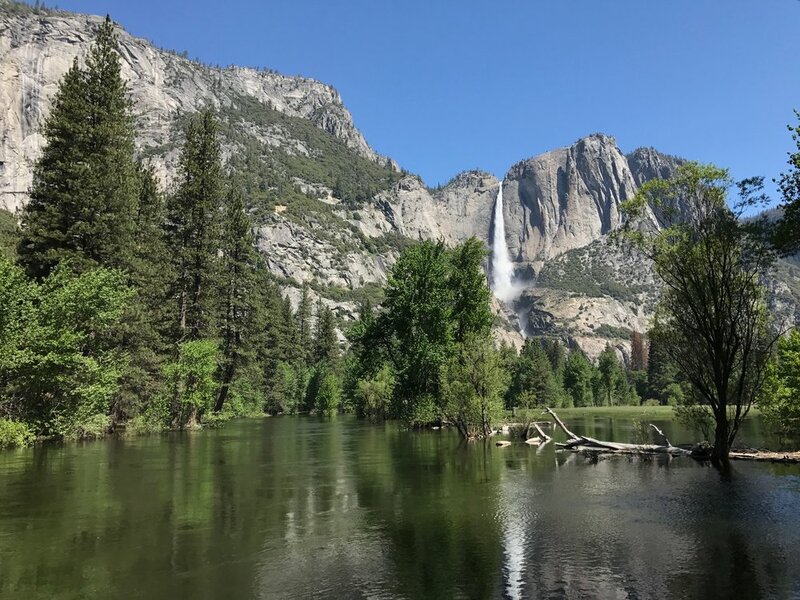 I was absolutely mind blown seeing the sheer power of Bridalveil Falls cascading down the rock face, Half Dome in the background, majestically standing proud, a stoic sentinel over this tranquil paradise. Fast forward to February of this year, and I had planned out another trip to Yosemite. Ever since my first experience, I had constantly talked about it with anyone willing to lend an ear. After working for many long months, I realized that I had lost sight of what I loved and where I needed to be. About a month later, my alarm went off at 0300 again, and I rolled out of bed ready for another adventure. With the classic cup of coffee in my car cup holder and some new tunes added to my road trip country playlist, I was ready to embark on another beautiful experience. As my friend and I crossed into Yosemite and passed through the famously familiar Tunnel View, I rolled down my windows to feel the cool morning breeze carrying the subtle scent of pine and freshwater. After being trapped in the city, it was refreshing to have natural air fill my lungs. With barely anyone on the road, we figured we couldn’t have picked a better time to come to the park. After all, it was just before peak season and it was the middle of the week. We drove in to our campground at 0900. Lo and behold, every site had already been taken for the day. Slightly panicking, I researched other options in the area. The only walk-in campground open was an hour outside of the park. Our last hope quickly became the daily lottery at the ranger station for any cancellations or no shows at the reserved camps. When we got to the station, there were already eight people on the list ahead of us. I would be lying if I didn’t say that I was very nervous we wouldn’t have a place to stay that night. A few hours later, we were back at the ranger station hoping that a spot would open up. In my favorite book, The Alchemist, Paolo Coehlo writes: “When you want something, all the universe conspires in helping you to achieve it.” The universe definitely came together not only for our group, but for everyone on the list, as it turned out there were more than enough spots that day. Finally, I could enjoy the peace and quiet I had been looking for. While Half Dome had been our main hiking goal for the trip, it was still closed for the season. We instead decided to tackle Upper Yosemite Falls, one of the more grueling hikes in The Valley because of its sharp elevation gain. After loading up our packs with enough water and snacks to make it through half a day’s worth of trails, we parked the car on the side of the road and began the trek. We started off the trail with 53 switchbacks (yes, I actually counted how many there were). We welcomed the break at the midway point where we could appreciate a beautiful panorama of the entire valley stretching from Tunnel View all the way to Half Dome. After cooling off at a local mountain waterfall that carried freshly melted snow down to The Valley floor, we continued our arduous trek up to the top of the falls. As we moved closer to our destination, the trees and rocks slowly gave way to soft snow lining the trail. Soon we were feeling the cool air laced with droplets of water blowing in our face. As we rounded a corner, moving a tree branch out of the way, we were struck by the awesome beauty and power of Yosemite Falls crashing down the rock face not 100 yards away. There are few things in life as breathtaking as seeing the most essential element of life cascading almost half a mile down to the valley floor. Just thinking about how something as simple and pure as water slowly eroding away at something as hard and unmoving as a rock over thousands of years truly makes you appreciate the unending power of nature. After appreciating the beauty and giving ample opportunity to hydrate and snack up, we took one last look at the majestic falls and began our descent back to the valley floor. For the rest of the trip, all I could think about was the power of Yosemite Falls, which was easily visible from our campsite. Seeing it later that day, I caught a glimpse of the setting sun, peacefully casting its last rays over the falls, turning it into a glorious rainbow cascade. After packing up our campsite and taking one last drive through the park, we departed Yosemite. I’ve always loved the drive down the 5 freeway running through Central California. Seeing the miles of open farmland and livestock roaming around, gives off a feeling of connection to the raw energy of this country. As counterintuitive as it may seem, there is more energy in the music of the outdoors than in the bumble of urban centers. Next time you are outside and away from the sounds of cars and city life, I urge you to sit quietly and listen as nature conducts its orchestra just for you. Feel the energy of life all around as you hear and feel the wind flowing over the land, the trees swaying and creaking gently in the breeze balanced by the quiet symphony of the creatures that surround. Arriving back in Los Angeles, the natural world quickly deteriorated into the hustle and bustle of civilization, filled with the cacophony of honks and the endless noise of civilization. The only things that remained of the serene trip were the memories and the quiet country songs playing over the radio, hearkening back to the beautiful moments of the epic journey. Music is an amazing part of humanity and definitely one of my favorite things in the world. However, sometimes the only music you really need is the melody that nature plays. George Santayana famously said, “The earth has music for those who listens.” Discover nature’s rhythm and how you contribute your part to the melody. Growing up in Southern California, Calvin fell in love with the ocean and fresh air around him. Through running and soccer he developed an active lifestyle from an early age. Road trips are his bread and butter and discovering new places runs in his blood.